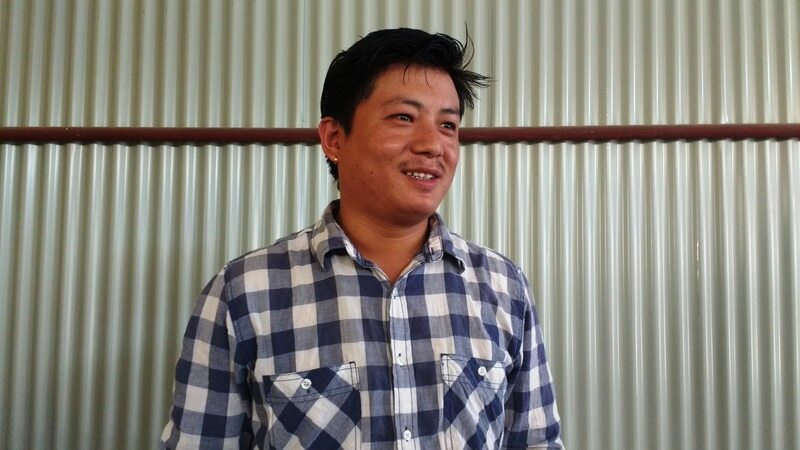 “I never thought people would come to interview me,” said Jaydev Poudyal, smiling warmly, as he arrived at the pretty garden café in central Kathmandu one sunny afternoon. The friendly 36-year-old is interviewed a lot. 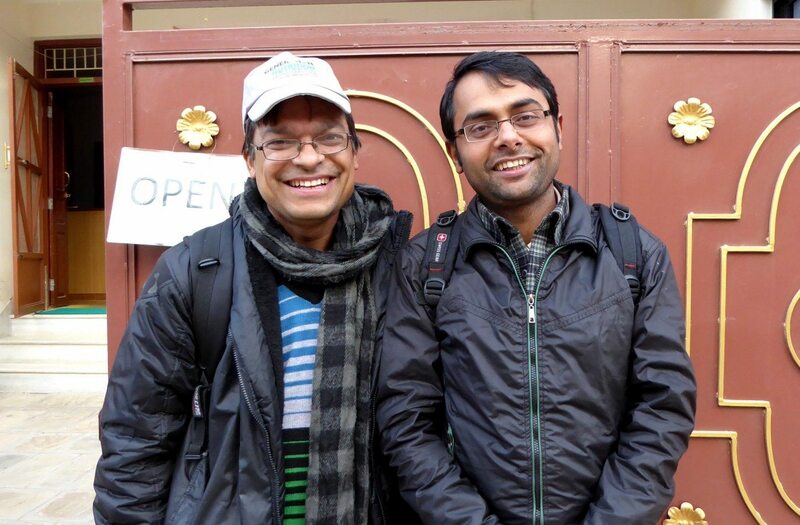 His blog, Stories of Nepal, was inspired by the runaway success of Humans of New York. Stories of Nepal started in 2013 with a photograph of a tea boy, and now, nearly 209,140 Facebook followers later, its beautiful photographs and stories have been a showcase for humanity in, among other places, post-earthquake Nepal. I was eager to meet the man behind it. 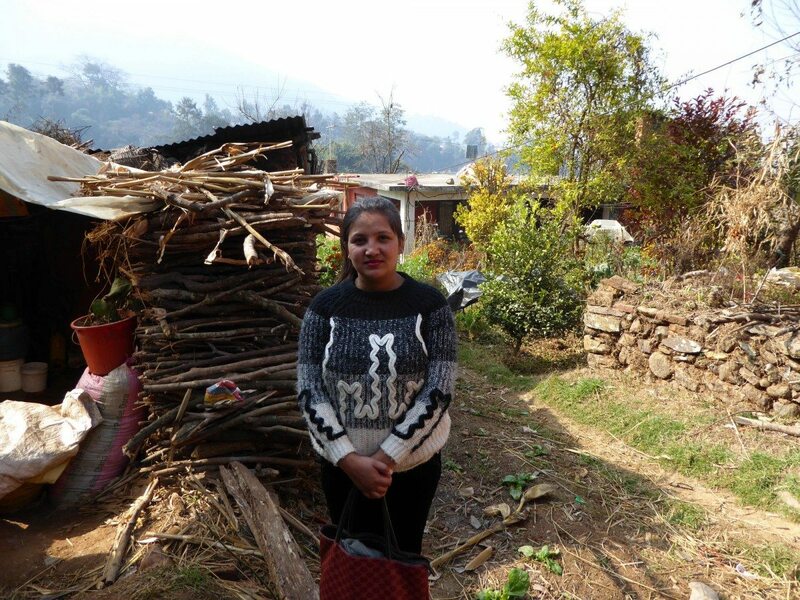 After all, in many ways Aftershock Nepal, the project I was in Nepal for, and the stories Poudyal published had a lot in common, seeking as they do to tell ordinary people’s stories. 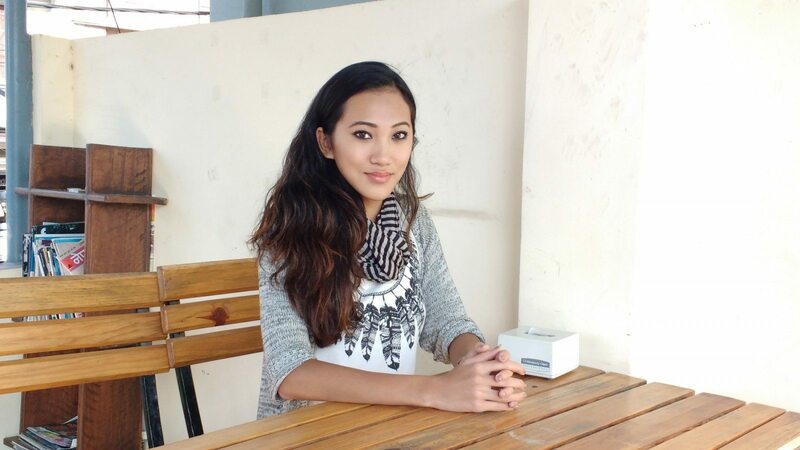 I had been admiring Poudyal’s blog for some months, impressed at the way in which he managed to bring out such humanity in his interviewees, and for the powerful photographs that seemed to instantly connect the viewer with the subject. I asked Poudyal if surrounding himself with such stories is ever overwhelming. “Oh yes, many times,” he said. “If I talk to someone and she’s sharing a story with me, I actually imagine myself speaking, saying the story. So for me your sorrow becomes my sorrow, I am inside this space of the storyteller, I cry sometimes when they cry, and I laugh when they are laughing, and I come home and it’s sometimes very hard for me to detach because it’s just difficult sometimes. IF WE rewind a little, to when we first arrived at the café, Poudyal’s own story gives some background to how his stories have such intimacy. We had just sat down and ordered—me a coffee, him a sandwich—and Poudyal began to explain how Stories of Nepal started life. What struck me about Poudyal’s story was that he never aimed to make Stories of Nepal the sensation that it is. I got the sense that there was a slight level of bemusement from him about the blog’s success. POUDYAL’S ADDICTIONS also had a huge impact on the relationship he had with his wife, who stood by him through his darkest moments. He spoke warmly and frequently of his appreciation of her. “Back then I was looking for some sort of security for the future, and I was going to drink and there had to be somebody to take care of me.” It must feel like beginning an entirely new relationship now, following that ordeal, I suggest to him. “Exactly, I was never capable to love, or be loved, and complained no one loved me and no one cared. If someone came to help me I would shut myself from them. Poudyal was not the driven individual he could possibly have been. The blog was not an attempt at fame or fortune, or a personal challenge to attain likes and shares. It was all beginning to make sense. I told him so. “Getting a story is not a job, it’s not a mission,” he said. “It comes from a genuine want to talk to the other person and understand them. As soon at the other person sees that, they are willing to open up more. It’s also me sharing my fears and my struggles, it’s a two-way process. How often does he get interviewed? “Oh, a lot, a lot,” he replied. “I like to talk, and one of the times I really get to share is through interviews, and I am really not looking for my thoughts to be printed or published, but I want to be nice. If someone likes Stories of Nepal and they want to spend their time talking to me, I shouldn’t say no. I am not really the interview kind of guy, I have made myself aware of the fact that because Stories of Nepal is appreciated, it’s my duty to. We sat in silence for a minute, before it was broken by Poudyal. “I think you have enough for two interviews now,” he said, laughing. It was time for us to finish our appointment. I said I would pay the bill. No, he insisted, I was his guest. “I thought you were my guest?” I responded. Too late, he had grabbed the waiter. I took some photographs of him, which, perhaps in keeping with his character but still a little ironically, he was shy about. He even insisted on giving me a lift to my bus stop on his motorbike, on the way showing me the house he had grown up in, and telling me more about what I should see in Kathmandu during my stay. As we parted, I felt like we had known each other for a long time. A wise friend once told me that you can see a hundred places in the world with one pair of eyes, or you can see one place in the world with a hundred pairs of eyes. Perhaps that is the power of projects like Stories of Nepal, one that journalists should take heed of. Too often our profession can see the excitement of the big events without narrowing our scope to explore them through the eyes and experiences of the hundreds of people affected by them. After all, our job should be to help people understand the world they are living in, and that’s not always easy when our subjects are given brief, walk-on parts, providing the lines we want them to provide, and filling in the gaps in our reports with the words we expect them to give us. And in learning about Stories of Nepal, I had found a story I did not expect to hear, but which made a lot of sense. 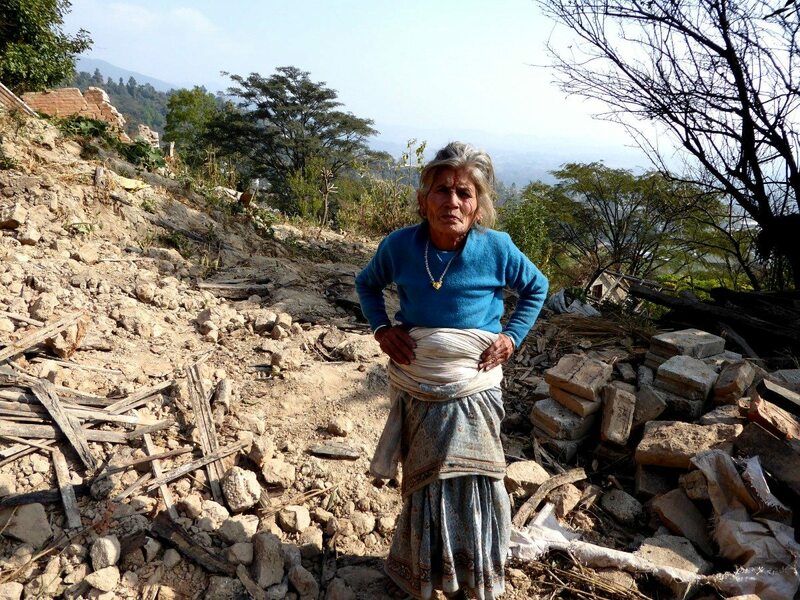 The earthquake of 25 April 2015 affected all sections of the Nepali society. What was previously taken for granted — houses, home, family, economic stability — is now viewed with sadness by many. As the new year begins, we look back at the year past, and hopes for the future, through the reflections of some whose lives have changed immeasurably. The year was full of pain and difficulties. Every house has got its own sorrowful story, and every Nepalese citizen suffer as we begin the new year. Some suffer from wounds, some were homeless and some have lost their relatives. It was such a situation that I cannot express it in words. Because of the earthquake, the nation bears such economic and physical loss! For a developing nation like Nepal this loss is more than a misfortune. 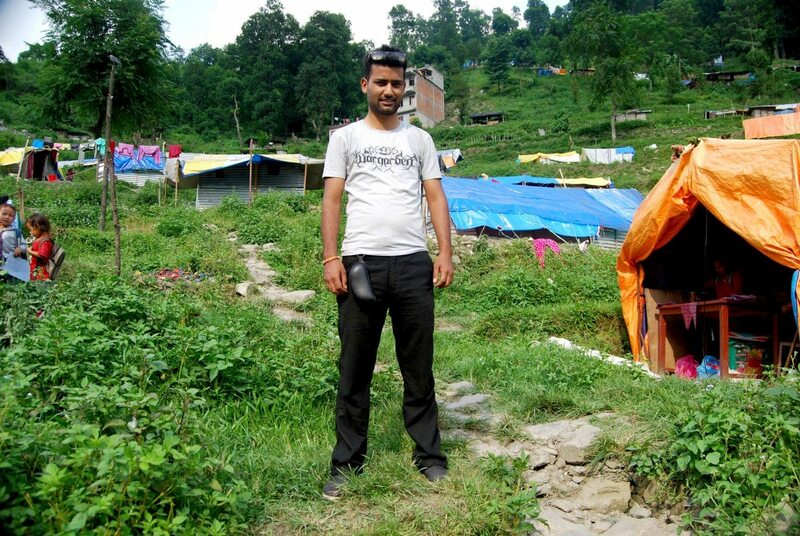 Dashain and Tihar were spent in tents and zinc houses. Happiness used to bloom in every Nepalese courtyard. But this year these things were replaced by pain, problems and difficulties. In many houses, meat used to be cooked during Dashain, sel and roti was the special dish. But the Indian blockade and fuel crisis didn’t let us cook such food. The Nepalese were victimised twice, thrice. First, political conflict already existed here. Second, the earthquake made the situation messed up. Finally, India’s blockade and fuel crisis made the situation much worse. The development of the nation has been pushed back 20 years because of all these things. Many youth don’t see a future in this country; I don’t see a career here. The black market has become rooted. Food prices have increased. There is no electricity. Who likes darkness? Nobody. I wondered how the earthquake victims are spending their cold nights in zinc houses. How are the small babies and old people? They must have hundreds of problems. The blockade issues have shadowed the victims’ issues. I am 25 years old. In these 25 years I have never seen a worse situation and never faced such difficulties as I faced this year. I wish no any nation or region face such a tragedy as Nepal has had to bear this year. Every nation has the right to live peacefully. I am worried for my family. As a mother, it was very difficult to protect my two-year-old baby. The quake left me in fear every second. I keep on holding her, my eyes are stuck on her, my mind and heart focused on her. I fear every night when I go to bed. If an earthquake occurs when I am sleeping, what should I do? Where should I run? I couldn’t focus on study or work because of this. The sound from a bus or bike can terrify me. Failure and loss are the stepping stones to success. Nepalis should take this loss as an opportunity to develop. It is natural platform to recover, and to reconstruct a beautiful Nepal by our own hands and efforts. Each individual should contribute to that. I was still sleeping in my bed when the earthquake hit Nepal. I was up the previous night, Friday, till 3am watching movies. I felt a sudden jolt. I woke up confused. My mind did not register immediately that it was an earthquake. Once it did, the fear of death started creeping in. I started crying and I ran to check on my grandmother, who was in the other room. I then pulled out a suitcase and stuffed it with my first aid box, food and clothes, and pulled my grandmother and ran out of the building. To my horror, there were buildings crumbling down. In our neighbourhood, the community had built a huge tent and we lived together there for a month. We ate boiled potatoes with salt for the first week. Our only source of news was from the radio. Even newspapers weren’t available that week. It was so scary. I saw so much devastation around me. People everywhere had lost their homes and loved ones. I felt really bad. I thought to myself, I have perfectly working arms, legs and limbs, so why not help those in need? I live outside the valley, where one can find a lot of old Newari houses built of mud and bricks. Most homes were completely destroyed as a result, and the people who survived were badly injured. My neighbour and I came together and bought basic medicines and first aid and distributed it to those in need. I was heartbroken to see all of it. People had lost their wives, their husbands, their grandchildren. I felt like crying but I didn’t, because at that point of time I had to be the strongest. For the first week I provided medical help. After that I asked my friends to help me out. Our group kept getting bigger, and we then started supplying people with food and rations. 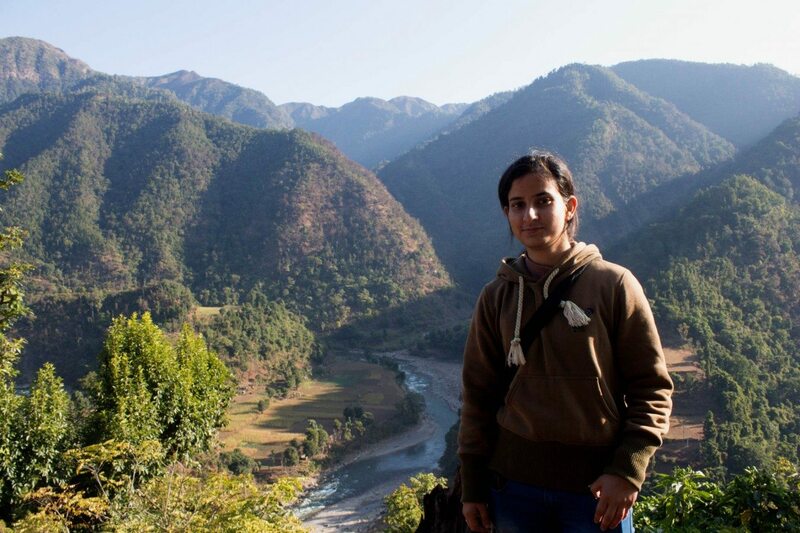 Initially, we helped out in the Kathmandu valley. We then went to the remote villages. All around, we saw people traumatised and scared. We made it a point to tell them stories and jokes, and try to make them laugh. The people needed motivation and hope. We distributed aid in Sindhupalchok, Harisiddhi, Bungamati, Gorkha, Godavari, Makwanpur and Nagarkot. We went to so many places that we had earlier not even heard of. Now we know the places and the people too. Our work went on till July. We also made temporary shelters of bamboo and tin roofs that we hope will sustain them at least for two years. Seeing the gratitude and the smiles on people’s faces when we approached them was the most beautiful feeling. I didn’t know that volunteering would help me so much as an individual. It gave me inner peace and happiness. I felt blessed because they told me, “God bless you”. It was a truly remarkable year for Nepal. It was remarkable in the tragedies that held us captive for most of the year but also remarkable in teaching us to cope with multiple disasters. The resilience shown by the people of Nepal in the face of natural and political disasters deserve historical remembrance. Already stumbling from one political impasse to another in the process of a peaceful transition, Nepal was brought to a standstill after the earthquake. Life was threatened with constant aftershocks, and the people were suffering from the loss of almost 9,000 people. In an unprecedented way, the people of Nepal, and especially youths, rose and joined hands to help in every way possible. In the midst of it all, the Constituent Assembly rushed through a constitution, reasoning that it was important to get that done before focusing its full energy and resources on rehabilitating earthquake survivors, even though a large section of the population was protesting against it. The logic behind this decision is a different story, but the promulgation of the new constitution led to another political disaster that has affected all parts of the country. The state’s apathy and brutal suppression of the protests by the security forces resulted in more than 50 deaths, including policemen, and led to an economic blockade as well as a highly polarised political climate. 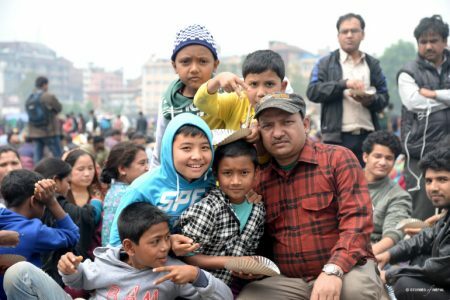 While the new coalition government is busy expanding its cabinet and breaking/forming new ministries, the people of Nepal are learning to cope. They are coping with the human loss from both the earthquake and the political crisis, with scarcities of devastating proportions, with the state’s apathy and the ordeals that winter brings in the earthquake-affected areas with no reconstruction or rehabilitation promised to them. It was a particularly revealing year for me as well. I’ve learnt that, against all odds, people in this country discover new and ingenious ways to survive tragedies and that it is important to do so. I’ve also learnt that, in a country like mine, it will be a long time before the people are respected and served by their representatives. But there is always hope, and one needs to keep constant vigil over it. Most of all, I’ve learnt that there is immense power in humans to overcome pain, even though it is most often hidden underneath all that despair. Here’s hoping 2016 will be a year of rehabilitation, bridging gaps and keeping promises in Nepal. Our building was shaking for more than 40 seconds and we felt we would die for sure. I instantly hugged my mother as I wished to die in her arms. While it was still shaking, we gathered all our strength and rushed downstairs into an open space. After an hour I went to see Dharahara, a very tall tower in the central part of the city, along with my cousin. Somebody had told me that it had fallen down and I wanted to see the extent of the damage for myself. All around I saw bodies being carried and heard a lot of crying. The whole of Kathmandu was in dust in a matter of minutes. After witnessing all of this, I feel like I am living a new life. God gave me one more chance and in this new life I am going to be a happier person. While taking the first step towards 2016, I realise a long year has gone by. Keeping 2015 in a balance of good and bad results in equilibrium. After all, amid day and night, there is life. My tragic 2015 started with me bidding farewell. The worst thing that happened in early 2015 was losing the senior-most member of the family. 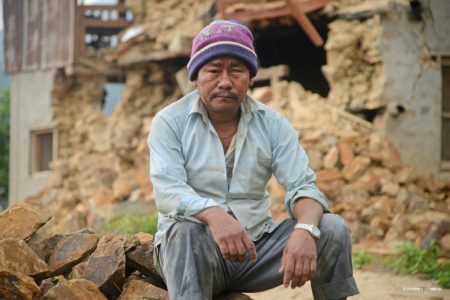 In April 2015, eastern Nepal was hit by the 7.8 magnitude earthquake, claiming the lives of around 9,000 people and affecting the life of hundreds of thousands, and affecting the economy of the country. Despite the pain of losing thousands of known and unknown faces in the disaster, the best thing that happened is to belong to the mass of people who witnessed and survived this major earthquake. The drafting of the constitution then acted as the catalyst for the turmoil in southern Nepal. While a group of people were busy celebrating the completion of the constitution of Nepal with firecrackers — finally, after a 10 year civil war and 10 more years of political instability — Tarai, an equally important region of Nepal, was burning with bullets and floods of blood. This was then followed by an embargo at the Nepal-India border, dropping the economic growth of the country and causing the crisis of petroleum products, cooking gas, day-to-day goods and materials for reconstruction. As the social, political and economic condition of a country is responsible to set one’s personal life, my life in 2015 revolved around the natural and political disaster. Despite the long night, somewhere, a spark of hope, though hidden, is always there. We can still hope to rise from the rubble, to find the common points and then be at peace. I was working in the Tatopani village in Sindhupalchok. My friend and me were on our way to have lunch. Suddenly the earthquake struck the area. Our legs were shaking and we could not control our bodies. Many tourists and other people were running around, searching for a way to support themselves. Then there was a huge landslide. A stone fell from the hill and hit my friend on the head. He was dead on the spot. He left us before he could say anything. We ran to an open place called Chauki Danda in Tatopani, where 50 to 60 of us went without food for three or four days. The road was totally blocked, so I could not return back to my home and family. I pray that day won’t repeat again. I will continue my work and secure my future after the disaster. Always waiting for others for our wants and desires cannot hold us back. My family and me are ready to work hard and sweat to forget the pain of this disaster. The year 2015 was a bitter experience in my life. It gave me pain and sorrow. Not only for me — the whole community did not have a happy ending to the year, either. For me, it was not a happy year, as I became sick after involving myself in earthquake relief. I was one of the victims of the earthquake. My house in the country got damaged and became uninhabitable. I also felt very horrible aftershocks in Kathmandu. I saw thousands of people suffering from pain, hostility, hunger and insecurity. I realised my responsibility in helping the victims, and moved to the epicentre district, Gorkha, on the day following the earthquake, with a team of 30 people, including my staff and volunteers. After contributing a lot in Gorkha by providing emergency shelter to 8,000 households, I went to Nuwakot after the second biggest shock on 12 May. Maybe due to heavy work and intolerable exertion for almost a month, I became severely ill with diabetes and high blood pressure, and my kidneys were severely damaged. I had to stay in hospital for 15 days and had to leave all of my team members who were in the field. I again joined a relief team in Sindhupakchok once I felt quite better. Now, we had to face the blockade by India which resulted in the fuel crisis. Our emergency relief work was severely hampered. However, we achieved getting a new constitution, and hope that it will help us in showing the way towards a peaceful society with progress and prosperity. All Nepali people, including me, hope that 2016 will help us heal the terrible wounds of the earthquake and the blockade by India. We hope that the relationship between Nepal and India will normalise again, and we will be able to focus on implementing the newly produced constitution. Moreover, we will be able to speed up reconstruction activities in the earthquake affected areas of Nepal. On a personal note, I hope to be healthier and stronger again, and that I will be able to contribute to society more in the new year. Last year gave us two different experiences. Pleasure, as we achieved our constitution, but also the trauma of the earthquake. We lost thousands of people within few minutes. Lots of structures were damaged and destroyed. Now, Nepal faces a blockade from India. But the Indian government is blaming it on the internal problems of Nepal. Over the past two decades, Nepal has faced the challenges of political instability. Power struggles have made the country weaker and weaker. Different -isms and ideologies made national identity more confusing. In a nut shell, over the year we felt different dimensions of life, crisis and consciousness, horror and harmony, sympathy and strength. I was on my way to cut grass for our cows when the earthquake happened. The earth began moving violently and trees were swinging about heavily . I found one of my grandsons half-buried in the rubble of our house. We rescued him with the help of the neighbours. My son and other family members were all there. Our house was completely destroyed. All our food and clothes were buried under rubble. But we couldn’t do anything. We just looked at it and cried. Now we live in shelter of zinc sheets. It is so cold. It’s winter season and we don’t have proper clothes or , enough food. I’m very much concerned for my grandchildren. There would be no reason to me to live if my grandchildren had died in that earthquake. They are my everything. On the day of the earthquake, my friend and I had gone to cut grass. She went home to get some rope and I was waiting for her by the side of the road. She never came back. She got buried when her house came down. I lost my best friend. She was like my sister. We grew up together from childhood. I sometimes look at the house where she was buried, and I can’t stop my tears. After the earthquake, I did not eat for three days. I got sick for more than a month. But we have to continue with our lives. My children and grandchildren are helping me to overcome. I think that wherever my friend is, she must be happy, because I believe that she is with god. I try to bear it because I know her memory will never die. No one can part me from it. Looking back is still painful. Every day seems terrifying. Remembering 25 April is hard. The lessons that we learnt were more than the pages of any text book. 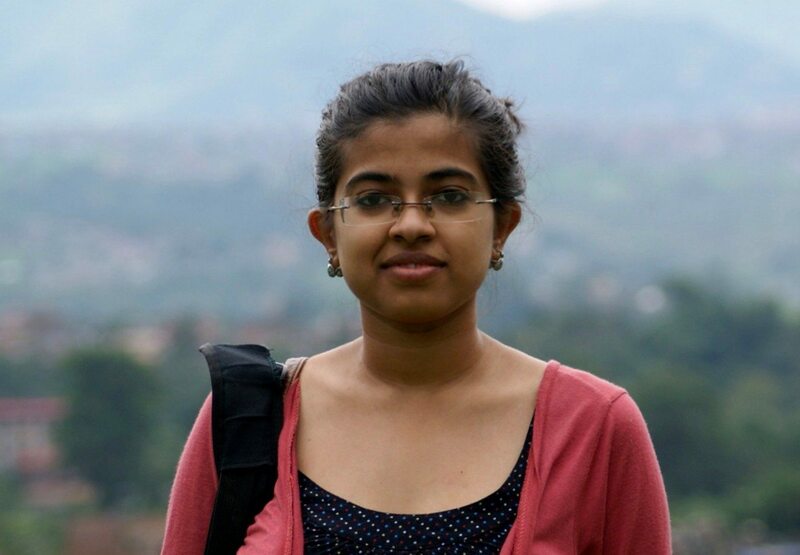 That day I was at my cousin’s home, in Basundhara, Kathmandu. It was Saturday, our day off, and my mind was eagerly demanding fun. After having lunch, five or six family members were having a discussion. Some others were busy watching TV. Suddenly, everything started shaking. We knew it was an earthquake, and we searched for the miraculous chance to escape from the house. When we reached the door, the magnitude was so heavy that we were struggling to stay upright. A motorbike fell down right ahead of us and blocked the way. One of us managed to push it away and we reached the open space. A girl, around 13 or 14, was crying and shouting for help from the terrace of the same house. We knew she had lost the key and was stuck. Me and my elder brother did our best to break the lock of the door. We rescued her, despite big aftershocks. We are forgetting the lessons that we learnt from the quake, like it was nothing to us. The National Reconstruction Authority (NRA) was built after eight months, and the CEO of the NRA was appointed in the last week of December. It’s winter season, and the government decided to give $100 to earthquake victims to protect themselves from the cold. But the distribution has not been effective. When will reconstruction end? When will people live their lives as before? When will these decades of political instability end? When will we be citizens of a prosperous nation? There is a saying, “Don’t lose your hope until you breathe the last.” It may take time, but we will live our lives as we used to on 24 April.